Although they are both broadcast meteorologists, Stephanie didn’t predict she was about to walk into one of the happiest moments of her life (ba-dum tch!) 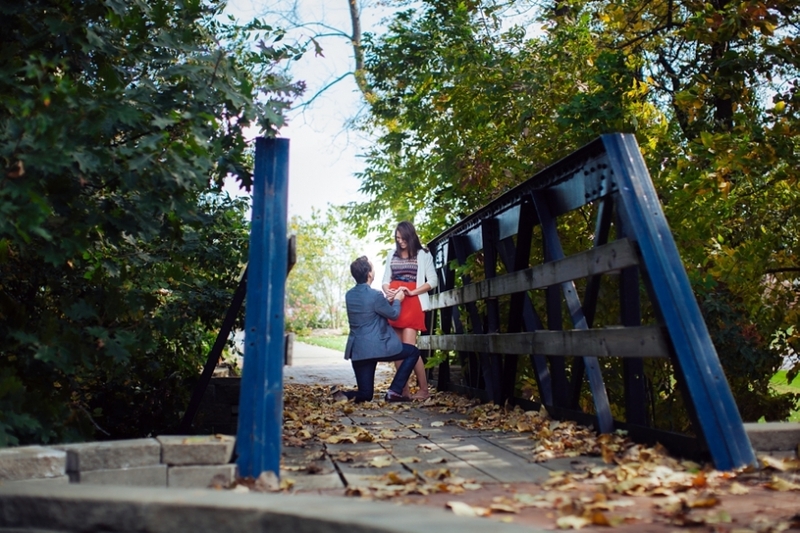 :) Justin told her they were just taking a walk around Valparaiso University’s campus and across the Kissing Bridge. The legend of the Kissing Bridge is simple. Way back when, the campus of Valparaiso University used to be closer to a railroad. This bridge crossed over the tracks. Legend says if a couple kisses while a train passes underneath, they will be together forever. What’s more, the soot from the passing train totally covers the couple, with the exception of their lips; a sign for all to see! With forever in mind, Justin thought this would be the best place to ask Stephanie to be his wife. He emailed me and asked me to pose as a studying student on a nearby picnic table to capture the event. The proposal had everything! Smiles, hugs, roses, and a serenade by Justin’s fraternity brothers. They were smiling ear to ear! Not only this, but I had the honor of photographing a short engagement session for them after the brothers left. I have never photographed such a happy couple! What an honor!!!! Justin’s fraternity brothers were crouched behind a wall near where I was pretending to study! Each gentleman gave Stephanie a rose! Congratulations you two!!!! To see their all-smiles surprise engagement session, click here! © 2015 Abbey Grim Photography|P5 Photo Blog by NetRivet, Inc.